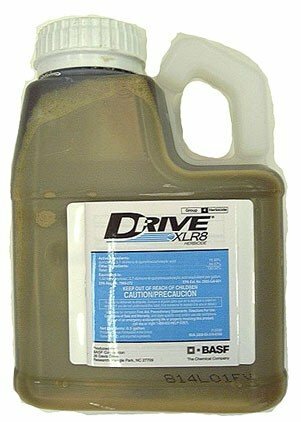 PRODUCT DESCRIPTION: Drive XLR8 herbicide is the latest technology in providing unsurpassed crabgrass control. A proprietary, water-based formulation, Drive XLR8 improves the control of crabgrass, torpedograss, kikuyugrass, several broadleaves (clover, speedwell) and numerous other troublesome weeds. Drive XLR8 provides faster, more effective weed control. It delivers quicker uptake by the plant. Is rainfast quicker (in less than an hour). Targets Bindweed, Crabgrass, Clover, Dandelion, Dollarweed, Foxtail, Kikuyugrass, Signalgrass, Speedwell, Torpedograss, and more. Drive XLR8 provides outstanding residual control for up to 30 to 45 days with a single application. Application areas include: Bermuda grass, Kentucky bluegrass, Buffalo grass, Fescue, Ryegrass, Zoysiagrass. NOT FOR USE IN: St. Augustine, Centipede, Bagiagrass, Bentgrass or Dichondra. RATE OF APPLICATION: Use 1 to 1.5 oz per gallon of water per 1000 sq/ft of turf.